Manchester City manager Pep Guardiola has reportedly requested the club trigger the €50million release clause of Real Betis left-back Junior Firpo. 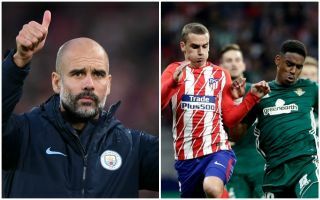 The 22-year-old looks a big talent after shining in La Liga, and City boss Guardiola could use his connections to get a deal done as the defender is represented by his brother Pere Guardiola, according to Don Balon. Firpo could serve an important role at the Etihad Stadium, with Benjamin Mendy struggling with injuries in his time at the club and not looking a reliable option as first-choice left-back. Firpo, meanwhile, looks a top talent ideally suited to Guardiola’s style of play, so City fans will hope there’s something to these rumours as the Spain Under-21 international is linked with the club. If City can land him for €50m that looks likely to become viewed as a bargain in years to come, with Firpo surely one of the finest young full-backs in the game right now.